Liguria is one of the smallest regions in Italy. This long, thin region borders the northwest coast, known as the Italian Riviera. Inland the region is mountainous and dotted with small villages. Genoa, near the center of Liguria, is the region's biggest city and Italy's main seaport. Genoa makes a good base for visiting some of the nearby Italian Riviera towns and villages by train or ferry. The city's sights include a large medieval quarter, Europe's second largest aquarium, and the 16th-century Rolli Palaces, some of which have been made into museums. For good views of the city and the sea, go up in the Bigo at the port or take the public elevator up the hill to Piazza Castello. 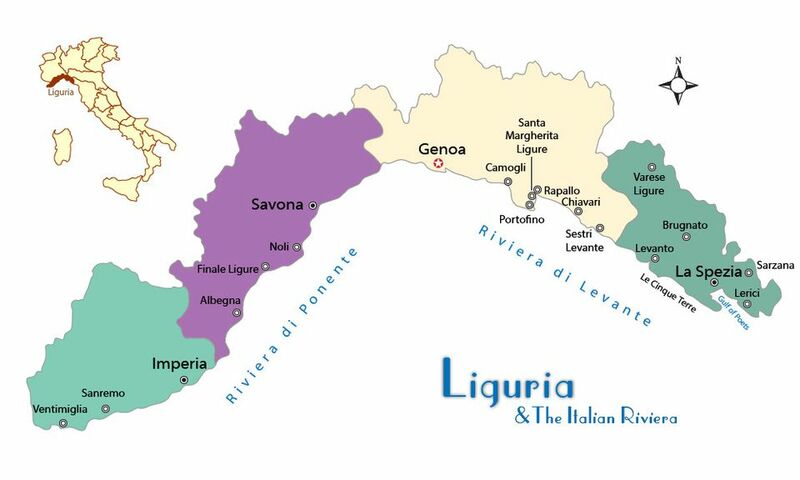 Liguria's La Spezia province is the start of the Italian Riviera if you're coming from the Versilia Coast of Tuscany. The city of La Spezia is a main rail center and ferries run to Portovenere, Lerici, and the Cinque Terre from its port during late spring and summer, making it a convenient base for those traveling by train. La Spezia has pedestrian-only shopping streets, a castle, several museums, and a big outdoor market. Le Cinque Terre, the five lands, are a group of five picturesque villages accessed by train or ferry. There are popular hiking trails between the villages and up into the hills. To use the trails you'll need to buy a Cinque Terre Card, which also includes local buses and one of the cards also includes local regional trains. If you want to stay right in one of the villages, be sure to book a ​Cinque Terre hotel or bed and breakfast in advance as there aren't many places to stay. The Cinque Terre, along with nearby Portovenere, make up a UNESCO World Heritage Site. Portovenere's harbor is lined with brightly colored houses. Narrow medieval streets lead up the hill to a castle, and a picturesque church sits on the tip of the promontory. The poet Byron used to swim in the sea near the promontory in what's now named Byron's Cove. This area, actually La Spezia Bay, is known as the Gulf of Poets. Lerici, also on the Gulf of Poets, sits across the bay from Portovenere. From Lerici you can walk to San Terenzo along the seaside promenade and there are hiking trails to small fishing villages to the southeast like Fiascherino, Tellaro, and Montemarcello. During summer there are ferries to Portovenere and Cinque Terre. Lerici has a castle, a beach, a small old quarter, and lots of seafood restaurants. Inland towns to visit include Varese Ligure with its round central piazza and a small castle, Brugnato for its infiorata or flower petal carpets for Corpus Domini, and the bigger town of Sarzana with a pedestrian center enclosed by walls, good shops including antiques, and two castles – one right in town and Sarzanello Castle in the hills above it. The Genoa province of Liguria includes the port city of Genoa and the famous seaside resort town of Portofino. Portofino, a favorite of the rich and famous during its 1950s heyday, is a beautiful village of pastel-colored houses surrounding a half-moon shaped harbor. Above the village sits the Castello Brown, reached by a walking path through the Botanic Garden. There are good hiking trails around Portofino and a marine protected area. Santa Margherita Ligure, a larger and more affordable town than Portofino, is often used as a base for visiting Portofino (by bus or ferry), Cinque Terre, Genoa, and other towns in Liguria using public transportation. It's on the coastal train line and during late spring and summer, ferries run from its port. You'll find a good selection of hotels and places to stay in Santa Margherita Ligure. Rapallo is another large resort town with a fishing harbor, a beautiful seaside promenade with hotels and cafes, and a medieval castle. A spectacular cable car ride takes you up to the 16th-century sanctuary of Montallegro, from where there are beautiful sea views. Camogli is a charming fishing village on a rocky outcrop. Camogli features pedestrian streets with shops and a small harbor with colorful houses, many with trompe l'oeil treatments, built right up to the fine beach. From Camogli or Portofino you can visit San Fruttuoso, an isolated fishing village reached only by sea or a 2- to 3-hour hiking trail. Between Camogli and Genoa, the small seaside town of ​Genoa Nervi, on the train line, is worth a visit too for its nice promenade along the sea. Situated at the mouth of the River Entella, Chiavari has a nice Botanic Garden, beaches, colorful morning markets held in the square in the town center, and one of our favorite traditional Italian bars, Caffe delle Carrozze. Sestri Levante is another large resort town. It's set on a promontory between two bays and has a nice seaside promenade with extensive views of the Gulf of Rapallo. On the tip of the promontory are the Castelli Gualino, imitations of medieval castles. There is also a walking trail to a signal station on the southern spur of Monte Castello. The part of the Italian Riviera known as the Riviera del Ponente stretches along the coast to the border of France and includes the Riviera dei Fiori, Riveria of Flowers. The hills are covered with greenhouses growing flowers and basil. The town of Ventimiglia is the last coastal town in Italy and from there you have a fine view of the French coast and you can take the local train into Menton, France, or on to Nice. Ventimiglia has a seaside promenade along its nice beach, an interesting medieval quarter built on a hill across the river from the more modern town, the Oratorio della Confraternita dei Neri, a Roman site, and a big covered market. Near Ventimiglia are prehistoric caves and Italy's largest botanical gardens, Hanbury Gardens, built on a hillside sloping down to the sea. Inland, visit the pretty villages of Dolceacqua, Apricale, and Pigna. Sanremo is probably the best-known resort town on the Riviera of Flowers. It's known for its casino and touristic harbor but it also has an unusual medieval center, La Pigna, with narrow pedestrian-only streets and alleys that wind up the hill to the pretty Madonna della Costa Sanctuary. The Cathedral of San Maurizio in Imperia is the largest in Liguria. Imperia has a museum, Museo dell' Olivo, devoted to olives and the famous Ligurian olive oil. Albenga is a walled town with a picturesque old town center, a Romanesque cathedral, and a 5th-century baptistery. Its Roman Shipping Museum has a good collection of amphora found by underwater archaeologists. Nearby Alassio has one of the most popular beaches on this stretch of coast. Finale Ligure is another resort town with a nice beach, a castle overlooking the town, and a picturesque historic center. Nearby is an early Capuchin church and the Monastery of Santa Caterina with an archaeological museum. Noli, a fishing town and seaside resort, has a castle, remains of town walls, an interesting old quarter, and a late Romanesque church. Savona, on a river, has a cathedral built in 1604, the Church of San Giovanni Battista with 17th- and 18th-century paintings by local painters, and an art museum.